Hannah Fagin experienced a great loss in sixth grade. When her grandfather passed away, writing became a source of comfort. The sixth grader has grown up to be an aspiring journalist. She is involved in Model UN, which is a program that lets students learn about the international peace keeping organization. Hannah also writes articles about crimes against humanity for the club Holocaust Genocide Project. “I think it is important for teenagers to be active in issues they feel strongly about,” she said. Hannah, 17, will be a senior at Cold Spring Harbor High School this year. She loves photography and is the coxswain, or the person who directs her teammates, for her school’s crew team. “My teammates have become my family,” she said. She has two younger brothers and a dog named Lola. She has not yet pinpointed a college major, but is fascinated by history, English and art. Hannah enjoys history because she likes learning about different time periods. 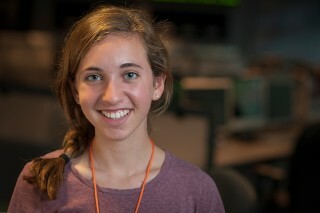 According to her mom, Beth Fagin, Hannah is multifaceted. “She is a unique combination of someone who is silly and someone who can be serious about issues she believes strongly in,” she said. Hannah expressed excitement about attending the Greene journalism program. “I want to see if journalism can be a future career path for me,” she said. Hannah’s grandmother really opened her eyes to the importance of art. She has taken numerous art classes to advance her talent. Her favorite photographer is Annie Leibowitz. “I am attracted to her work because I like how she can take elements of pop culture and turn it into the higher culture of art,” she said. Her favorite author is John Green, who wrote the recent bestseller “The Fault in Our Stars”. Her favorite book, however, remains J.D. Salinger’s “The Catcher in the Rye”. Hannah favors the novel because she can relate to the protagonist. Being informed about worldly issues is important to Hannah. “I believe that writing is vital and has the power to affect the course of history and people’s lives,” she said. Hannah said she enjoys writing as a way to express herself, but acknowledges that it can be challenging. “Having an idea and not having the writing come out the way I envision it is the hardest part of writing,” she said. Hannah is eager to see where her writing will take her. Among the careers she is considering is becoming a high school English or History teacher.